Why dress up as a handsome prince when you could be the king? 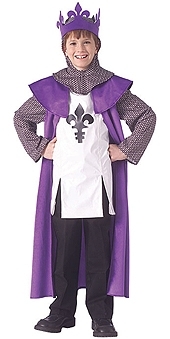 The purple crown has attached cowl, which matches the sleeves of the tunic. Also included is the full length purple robe. Size: Small - Out of StockMedium - Out of StockLarge - fewer than 5 available for next day dispatch.